Sophia has leopard shoes that match nothing and she wears them with everything. Your girls are beautiful. Maybe an easy Halloween costume this year?! 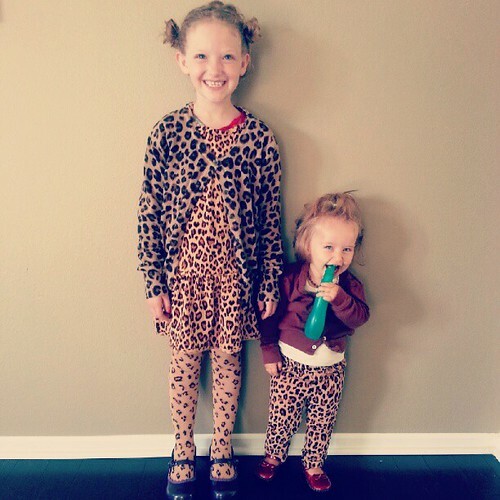 Although knowing her and you via the www, the leopard is probably so last year for Halloween! My 7 year old went to school head to toe in different shades of pink last week, because it matched. She topped off the light pink and other pinks with a hot pink blazer. You make good kids, yo. Ha. I love it. Makes me want to put on some leopard print if I had it! Cannon is going to want Addie to wear that to their wedding. I have a feeling that she’ll be happy to, at least for the reception. Also, he is always begging me to wear my leopard flats, and when we went to the Field Museum, he made me take his picture with pretty much every cat in the place. We should just write up the marriage contract now. 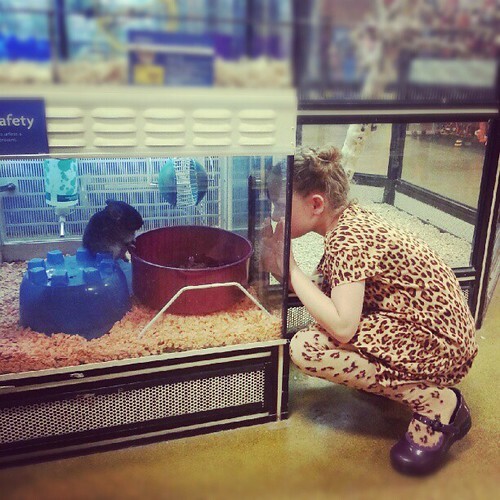 My stepdaughter wore a leopard print shirt with a pink fluffy tutu skirt and snake skin print leggings once. I feel your pain lol. Hi, I’m a relatively new reader here. Your girls are precious! Also, I think we live around the same parts. Where did you get Vivi’s leggings? My 10-month old must have them! They’re like jeggings. I wouldn’t wear them, but I’ll happily put them on my kid. @KDA, They’re fine wale cord jeans from GapKids. Super cute. OMGosh! I love it! Just had my first girl 9 months ago. I look forward to these future adventures. The nice thing is that she’ll be easy to “spot” in a crowd. HA. Sometimes I just crack myself up. Yes, I’m an idiot- I freely admit it. I had two little sisters who used to do the same. They used to gang up on the poor animal and scare the hell out of it !!! just clicked through all the clicky posts. Because, I KNOW AND UNDERSTAND.